I am from a small town where almost everyone is Catholic. So on Ash Wednesday every year the citizens of Falfurrias understood why 90% of the population walked around with what looked like black dust on their faces. It wasn't until I went to college that I realized some people did not know what Ash Wednesday was. Freshman year I went to Mass at noon and then went straight to class. On the way there two people stopped me to tell me there was something on my face. On a normal day I would have been very appreciative. I mean who wants to walk around with stuff on their face...EMBARRASSING! However, on this particular day it annoyed me. I explained to them that it was Ash Wednesday and the start of the Lenten season. In the end it was an educational experience for us all. I learned that not everyone is Catholic (obvious I know...but I lived in a South Texas bubble at the time), and I educated some Aggies on Catholicism. 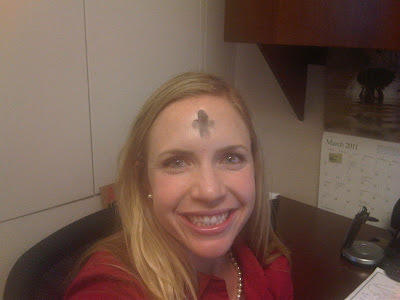 So here I am today...with something on my face...hehe....trying to decide what to give up for Lent. I am leaning towards all sweets....I do love them...and Lent is a time for sacrifice. I also want to try to remember how lucky I am whenever I start to get pouty or want to complain. I have food on the table, a roof over my head, a loving boyfriend, an incredible family, and amazing friends. I have no reason to whine. Also...on a side note...this is not a "my religion is better than your religion" post. I love all cultures, religions, and spiritual views. Whether you are a Buddhist, Christian, or Atheist, I respect your practices and love learning about other people's religious views and perceptions. Anyway that is my shpeel for today....Don't forget to wear red tomorrow for Aids Awareness Day!